Inspire and educate with our posters, pencils, and other materials designed for a range of audiences. Contact us to order copies at nkurtz@ldeo.columbia.edu or download your own. Science is a dynamic, non-linear, creative, and collaborative process that takes researchers on unique journeys of discovery. This poster highlights the pathway one microbiologist and her colleagues follow to unravel the mystery of what is living in the rocks and sediments that make up the ocean floor. This mini-poster showcases the JR on the front, and background information about scientific drilling and activities for following the ship on the joidesresolution.org web site on the back. It is appropriate for all ages. This poster shows several different images of microfossils, taken through microscopes. The microfossils were found in cores recovered by the scientific ocean drilling vessel, JOIDES Resolution. When a core is brought up on deck, scientists look at these slides to identify the microfossils found in cores and determine the age of the sediment, as well as something about Earth’s past climate. The activities on the back of the Microfossils poster simulate the identification and use of these microfossils to examine past climate change and Earth history. The artwork on this poster depicts research on microbe diversity in the deep biosphere. The activity on the back utilizes Lego blocks to model a method microbiologists use, called Fluorescence In-Situ Hybridization (FISH), to “tag,” identify, and study microbial diversity deep below the sea floor. This is a poster about methane hydrates that illustrates the chemical formation of gas-bearing ice-like structures deep below the world’s oceans. Inspired by IODP research expeditions dedicated to methane hydrates, A Bolt from the Blue outlines the structure and sources of methane hydrates, introducing fundamentals for advanced chemistry and/or Earth system science courses. Utilizing the images and captions on the front of the poster, educators may easily transition to various classroom activities provided on the back. Note: Out of print, but still available in PDF format for download. This poster illustrates an Earth meteorite impact event in our planet’s history. 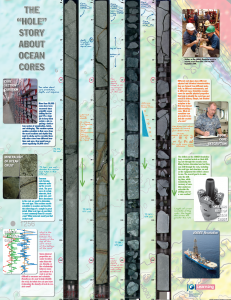 Through illustrations and descriptions of the evidence retrieved from a core, the poster presents classroom activities that link ocean drilling science with historical events in the Earth’s past. Unveiling the history with their own hands, students experience aspects of ocean drilling science at an intermediate level. This poster won a 2008 Distinguished Achievement Award from the Association of Educational Publishers. 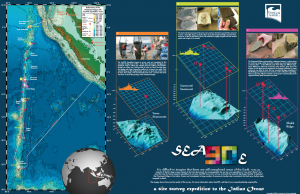 This poster will introduce your students to core description and curation techniques used by scientists and technicians during Integrated Ocean Drilling Program Expedition 309. The image on this pencil is of the Cretaceous/Tertiary core that documents the meteorite impact that took place 65 million years ago. The JR goes origami! Fold your own paper model of the ship, complete with helicopter. The JR goes plushy! 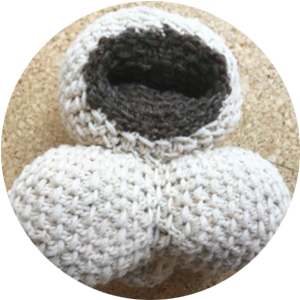 Make your own knitted microfossil. These knitted patterns help to provide students and educators an example of what a microfossil looks like on a tangible scale. Crafting and the arts are incorporated in the STEAM movement as a means to be more inclusive of the ways in which many people learn to appreciate the scientific relationship between structure and function, and beauty in nature.